The MS-1 is the smallest and lightest of the Tier 1 tanks. 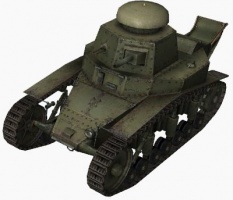 The vehicle possesses features that make it visually and audibly unique: It has external features such as a turret cupola and trench-crossing tail which resembles a "hat" and "tail", respectively, and the engine makes a distinctive "puttering" sound. When equipped with the 45 mm mod. 1932 gun, The MS-1 has the damage potential to kill any other Tier 1 tank in approximately three shots. This rate of damage, when combined with the 45 mm gun's penetration (superior to all other weapons found on Tier 1 tanks), makes the MS-1 a formidable opponent in Tier 1 battles. The MS-1 leads to the AT-1, the T-26, the T-60, the BT-2, and the SU-18. The 45 mm mod. 1932 gun has the highest penetration value in Tier 1, as well as acceptable accuracy and good damage. Small size and good camouflage values makes it easy to hide and difficult to detect and hit. One of the few tanks in the game that can be considered "cute" in any capacity. Lowest amount of HP in Tier 1. The MS-1 is a very capable and forgiving Tier 1 tank, making it an excellent starter vehicle. It is slower than the American and German starter tanks, but it has the thickest armour; the frontal armour in particular is almost twice as thick as the T1 Cunningham's (although 18 mm of armor is not going to stop much incoming fire to begin with). Unfortunately, the MS-1 has the lowest amount of HP out of all the Tier 1 tanks, and cannot take too many hits. The starting gun, the 37 mm Hotchkiss, is decent enough against other Tier 1 tanks, but it is very inaccurate. The 45 mm mod. 1932, though, is probably the best single-shot weapon available to any Tier 1 tank. It has the highest damage and penetration values for its tier, effectively penetrating all but the most heavily-armored tanks that the MS-1 faces; sniping with this gun can be very effective. The high damage-per-shot also makes it excellent for taking snap-shots while playing "Peek-a-Boom" (moving out of cover, taking a quick shot at close range, then moving into cover again). Both of the guns have very long aim times (2.5 seconds), with only the QF 3-pounder on the Vickers Medium Mk. I having a longer aim time at Tier 1. The MS-1 has the lowest horsepower in Tier 1, and is one of the slowest for its tier as a result. It is decently maneuverable, with fair hull traverse and excellent turret traverse speeds, but it can have trouble climbing steep slopes. Combined with the excellent guns it can equip, these factors make the MS-1 well-suited to a more careful and deliberate play style, as opposed to the more aggressive play styles of the Leichttraktor or T1. 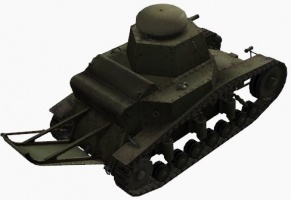 The MS-1 is also one of the smallest tanks in the game, making it much more difficult to both detect and hit, compared to the other Tier 1 tanks. With a Camouflage Net, it is nearly undetectable until it fires. Choosing Camouflage for both crew members as their first skills can turn the MS-1 into a near-invisible tank. The combination of Snap Shot (Commander/Gunner/Radio Operator/Loader) and Smooth Ride (Driver) are other viable options for first skills, allowing the MS-1 to get its shots off faster after coming to a halt. Upon reaching 100% on the first skills, you can drop the Commander's skill for Sixth Sense, allowing the tank to be alerted after being detected. Brothers-in-Arms will improve the tank's performance, but it requires all crew members to have it at 100% before it works (With only two crew members, though, this should not be too much of a challenge for the MS-1). The bonus to crew skills is particularly noticeable when combined with Improved Ventilation. The 45 mm cannon is the only module available for research, so get that. The MS-1 (T-18) was not only the first mass-produced Soviet tank, but it was also the first armoured vehicle that was fully-developed in Soviet Russia. Part of its design was borrowed from the FIAT 3000 and Renault FT, but it was overall superior to them, and was very well-matched with the interwar tank designs of the mid-1920s. The MS-1's story begins with the first Renault FT tanks arriving in Russia on December 12th, 1918. 20 vehicles, as part of the 3rd company of the 303rd assault gun regiment, arrived at Odessa, along with French and Greek forces. On March 18th, 1919, 4 of them were captured in battle next to the Berezovksaya station, close to Odessa. The interventionist forces fled from the battle, and Nikifor Grigoriyev's 1st Transdniepr Brigade collected the rich bounty. One tank was sent to Moscow as a personal present to Vladimir Lenin. The remaining three were sent to Khrakov (the capital of Soviet Ukraine at the time); Lenin liked the "French novelty", and wanted to display it at the May 1st parade in Moscow. 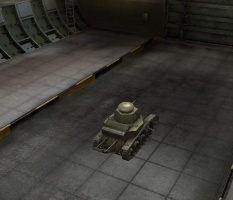 For this, another tank was requested from Ukraine (the first was missing parts, and was thus immobile). The second tank arrived in Moscow in the last week of April. Former aviator B. Rossinskiy was assigned as its mechanic. Amazingly, he figured out how the unfamiliar machine worked in one night, and, with two assistants, he put parts of the two tanks together into a functioning one. The government then decided to mass-produce Renault FTs in the RSFSR, and on August 10th, by the decision of the SovNarKom and the Council of Wartime Manufacturing, the Krasnoye Sormovo factory in Nizhniy Novgorod became a specialized tank-producing establishment. The tank that took part in the May 1st parade was shipped to the factory on September 29th, 1919. It was disassembled and spread among three railroad cars. The tank did not arrive in full: Several components were stolen on the way, namely the tank's gearbox. The lack of a gearbox proved to be an unfortunate surprise for the engineers. N.I. Hrulev and P.I. Saltanov led a special team of engineers who were tasked with redesigning the missing components and setting up the mass production of the tanks. The project was completed in four months, and the construction of "Russian Renault" tanks began in December. By 1920-21, 15 tanks were built, each with a unique name. The first (and most famous) Russian Renault was named "Comrade Lenin, Freedom Fighter", and gifted to Leon Trotsky, who was the head of the Revolutionary Military Council at the time. The tanks differed from the French ones in armament, with their French guns replaced by weapons that were more available in the fledgling country. The hexagonal turret was produced with no changes, even through the Renault FT already had a modernized conical turret in France. Due to the lack of a manufacturing base, the release was limited to the original 15 vehicles. 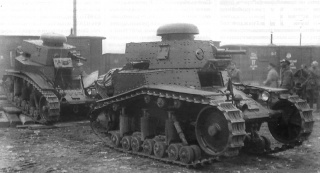 Armoured units in the Red Army were mostly equipped with British tanks captured in the Russian Civil War, such as the venerable Mark V "landship". In the Spring of 1924, the Tank Bureau of the Chief Directorate of Military Manufacturing was formed, and on May 6th began its work. None of the engineers had any experience with designing armoured vehicles, and they completely lacked any sort of documentation. In September of 1926, a meeting between the RKKA command, the Chief Directorate of Military Manufacturing, and the Cannon Armament Group took place, in order to determine the requirements for new armoured vehicles for the Red Army. Various foreign tanks were reviewed, to judge their worth as a basis for a new tank. The French Renault FT was capable of infantry support, but according to those present, it had a series of serious flaws. The Italian FIAT 3000 was a more satisfactory prototype, with a higher speed and lighter mass than the FT. The tank had been studied by Tank Bureau engineers since 1925, as a part of a project for a new 3-ton light tank. 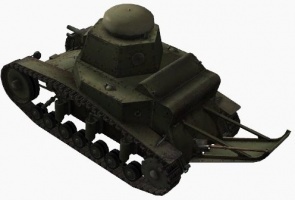 The OAT Construction Bureau (formerly known as the Tank Bureau) showed that the tank met most of the requirements, but it lacked a cannon and needed an engine of at least 35 horsepower. 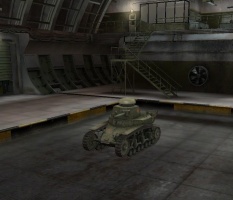 The tank that was to be created was indexed as the "T-16". In March of 1927, the first T-16 drove out of the gates of the experimental design bureau of the Bolshevik factory (formerly known as the Obuhov gun and steel factory). Compared to the Russian Renault, it was shorter, lighter, more mobile, and much cheaper (the Russian Renault costed 36,000 Russian Rubles per tank). 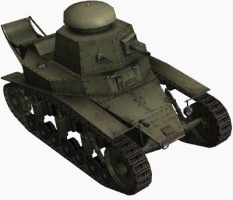 Compared to the FIAT 3000, the engine, suspension, and armament were changed. The FIAT gasoline engine (AMO produced clones of it for the Russian Renault) was replaced with a new one, created by the talented engineer A.A. Mikulin, who worked at the Scientific Auto-Motor Institute at the time. Trials of the T-16, however, revealed faults in the engine and suspension. The second prototype, indexed as "T-18", was finished in May of the same year. The tank underwent trials between June 11-17 of 1927 next to the village Romashkova and railroad station Nemchinovka, purely for its cross-country capability as its gun was not yet ready. 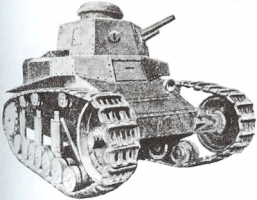 Trials were successful, and the tank was accepted under the index "Small support tank model 1927" (MS-1). The first 30 vehicles were paid for by the Osoaviahim organization, and took part in the November 7th, 1929 parade under the unofficial slogan "Our answer to Chamberlain". 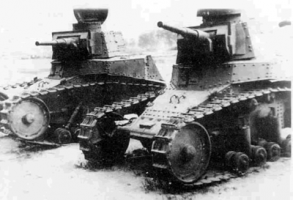 In total, 959 MS-1 tanks were produced from 1927 to 1932. 4 of them were sent to the OGPU, 2 were sent to the Fourth Directorate, and one was sent to the Military Chemistry Directorate of the Red Army. The tanks were assembled into tank battalions, and larger mechanized units (like regiments and brigades). The MS-1 was actively used to train troops: The first 103 vehicles were immediately given to Osoaviahim and other military academies. The first serious trial of the MS-1 was the Large Bobruisk Manoeuvres of 1929. Despite the harshness of the manoeuvres, the tanks successfully completed them, albeit not without minor breakdowns. 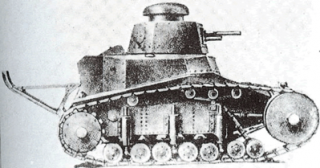 Those breakdowns were the cause for the modernization of the tank during 1929-30. The modernization objectives were to increase the speed to at least 25 kph, install a high-power 37 mm gun, and replace the machine gun with a more modern one. The turret was completely redone, the commander's cupola was improved, and the tank received a bay in the rear of the turret for a radio station. 10 MS-1s took part in the conflict at the East China Railroad. The Transbaikal Group of the Independent Far East Military District contained 6,091 infantry soldiers, 1,599 cavalry troops, 88 guns of 76.2 mm caliber or higher (not counting regimental artillery), 32 airplanes, 3 armoured trains, and 9 T-18 tanks (10 arrived in China in the fall of 1929, but one was heavily damaged during offloading and was taken apart for spare parts). Despite suboptimal organization and a lack of fuel and ammunition, the performance of the company was judged as adequate. However, the drivers were insufficiently trained, commanders did not know how to find their way, and tanks had no methods with which to communicate with each other: This was made evident in an embarrassing episode during the battle for Dzhalaynor Station, where the skillfully-led company of MS-1s managed to gain the upper hand but were then quickly thwarted in their advance by a tailor-made anti-tank ditch, despite being equipped with trench-crossing rails by default. Also, the tank's gun was quite inadequate against fortifications. The machine guns, however, were an effective means of demoralizing and neutralizing the enemy. Requests were made for a larger-caliber gun, more machine guns, better off-road performance, more speed, and more armour; tank forces had a long way to go before they would become the most effective method of war in the mid-20th century. The MS-1 served as a basis for specialized vehicles. Due to its rapid obsolescence, many of these did not advance past blueprints or experimental prototypes. A chemical tank, for instance, was designed for putting up smokescreens. A tank called the TT-18 was tested as a remote-controlled tank (which would then be used as a self-propelled mine or a chemical warfare vehicle). Various projects for tankettes, APCs, assault guns, and engineering vehicles based on the MS-1 never left the drawing board. The SU-18 project, which is discussed elsewhere on this wiki, was also developed, but it too never made it to the prototype stage. Elements of the MS-1 can even be found in Soviet tractors of that era, reflecting its widespread versatility. The modernization of the MS-1 in 1938 did not result in much improvement, and the question of retiring the tank arose. By that point, 862 vehicles remained out of the original 959; the rest were either taken apart or scrapped. Most of the surviving tanks were re-armed with 45 mm model 1932 guns, and re-designated as "T-18Ms"; T-18Ms that had completely exhausted their mobility resources were taken to fortification regions, had their suspension removed, and were dug into the ground as stationary gun emplacements. Still-mobile T-18Ms were assigned to these regions as mobile artillery. These tanks apparently saw action during World War II: Several T-18Ms in various stages of combat readiness can be spotted in photographs taken by advancing Germans in 1941. There is little record of MS-1s fighting in WWII: The Osovets (#66) fortification region had 36 armoured turret emplacements (including T-18Ms) with 45 mm guns, and two tank companies (The 1st, with 25 T-18Ms, was stationed at Kolno, and the 2nd, with 18 T-18Ms, was stationed at Belyashevo). The 2nd company successfully fought off German armoured vehicles, most of which were early-model armoured cars and light tanks that were easily-penetrated by the formidable 45 mm gun. 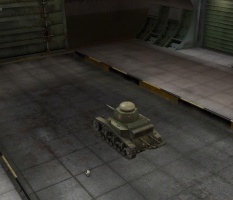 There is evidence that T-18Ms even took part in the Battle of Moscow in the fall and winter of 1941, when the Soviets were desperate enough to throw anything with a gun and armor into the fight regardless of their actual fighting potential (namely outdated tanks like the MS-1 and brand-new prototypes like the massive SU-100Y). The MS-1 was eventually replaced in its official support role by the T-26 light tank, which was adopted in 1931. After an eventful history, more than 20 MS-1s currently survive in museum exhibits and as war monuments. Hulls and spare parts are occasionally found by archaeologists, and a number of these vehicles are currently being restored. Due to the number of MS-1s that served through the war as immobile turrets, there are serious problems with restoring their own suspension: Not a single original track link has been found yet, and original road wheels and shock absorbers are in scarce supply. Because of this, the suspension of all restored MS-1s is not original. At least one up-gunned T-18M has survived to the current day in the Russian Victory Park in Moscow, albeit as a static emplacement that is missing its suspension and tracks. This page was last modified on 2 April 2019, at 00:03. This page has been accessed 258,010 times.